These are a great addition to my lighting for running. I usually run early in the morning in a rural area, where very little ambient light is available. These are sufficient by themselves to provide adequate visibility for running, but would need to be supplemented for biking. For those worried about the half fingers in the winter, mittens are available, and the lights are interchangeable. I am very happy that I found these! These gloves are amazingly comfortable and totally worth the time to order a pair or two!!! So many uses, such as walking the dog, lighting a dark path walking in a parking lot, or working under the sink. I love these gloves!!!! I bought these as a gift for my sister who is a runner, She runs very early in the morning and she was thrilled to receive them. She wears them every morning! 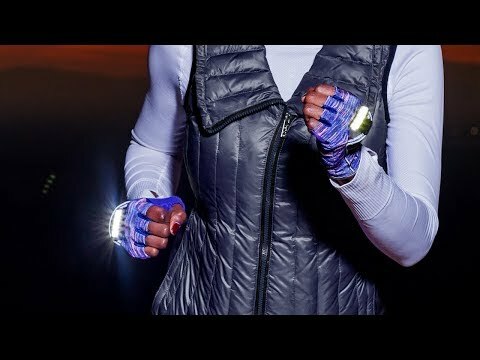 When I read about these gloves, I knew I had to get them for my daughter and son-in-law who are avid, bikers, hikers and runners - often before or after the sun rises or sets. They LOVE them. I am so happy with these MangataLites Rechargeable Lighted Gloves. My friends and I are training for race season and several lights were out at the park we run through. She had a head lamp and I had my gloves. My gloves were able to light the way much brighter and much wider area. I always have them with me now. Love them!! My niece loves them. Runs marathons and the gloves have really helped!!!! 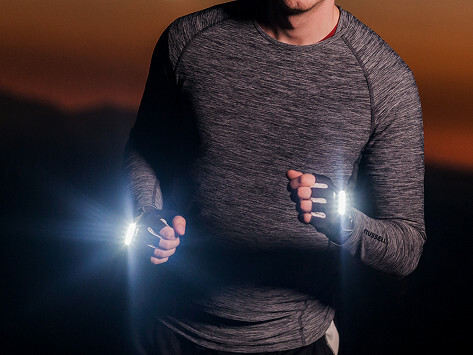 I bought these gloves so that I wouldn't have to carry a flashlight when I'm walking my dog in the evening. They work great, give plenty of light on the road while I'm managing the dog, they also fit over another pair of gloves in colder weather. A wonderful product! Perfect for night time dog walking! As another review mentions they do not provide warm;however I like this as they will not be hot during summer months. I have been able to wear gloves underneath, tho Iwish I had consider that sooner and bought a size up. Still comfortable but more wiggle room would be an added bonus. What I like, are that the lights are very bright. They Conveniently brighten, turn off and dim. I also really like there is a small pocket for a key which will be especially helpful in summertime when I have fewer pockets! All around great design and well made! They work exactly as I hoped. Walking the dog in the early morning is great with these. I have them over another pair of gloves for the winter. I got these to use on my long walks with the dog. This time of year it is dark for either the morning or afternoon walk. The gloves are comfortable and add some (but not too much) warmth. the light is very bright. I like having two - the one on my leash-holding hand one shines down on the dog, the other I can direct to see my path or be sure traffic from either direction is aware of my position. The more visible I am, the better. I always wanted more lights, but waited until they were available in rechargeable format.